and reboot the device. Ensure all packages installed ok.
2. Best to reproduce this issue is a Nexus 4 with Slimport cable & external monitor. Connect the N4 to the monitor. Bug: the initial size of the WebView is much too small. It is not filing its QQuickItem. If you resize the webbrowser window, that fixes it. This *might* be qtubuntu's fault. I fear when webbrowser starts while monitor attached, it believes its window is on the phone screen initially, so uses that scale. While setting up its window, then it is informed the window is moved to the external display, and the scale is then corrected. I'll also try to have Oxide placed on the correct surface at absolute startup. 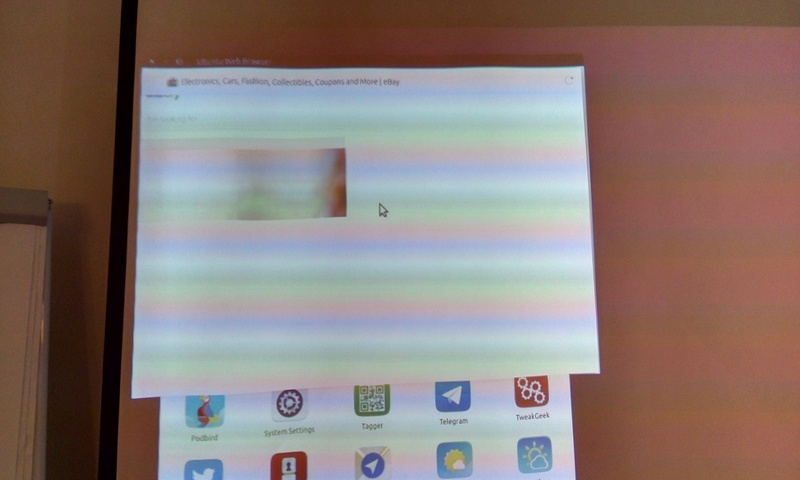 That'll be a qtmir/qtubuntu job, I'm look at it now. Here is my debugging output (I manually added printfs to qtubuntu wherever scale is requested). I am also not seeing the "screenPropertyChanged" from qtubuntu, probably also a bad thing. could not open containers config file "/home/phablet/.local/share/libertine/ContainersConfig.json"
ubuntumirclient: Got invalid serialized mime data. Ignoring it. > also a bad thing. 2. Qt creates window on the "primary" screen - which is the first screen it ever saw. This is the phone screen. might have an impact. I hope Chris can try this out soon.